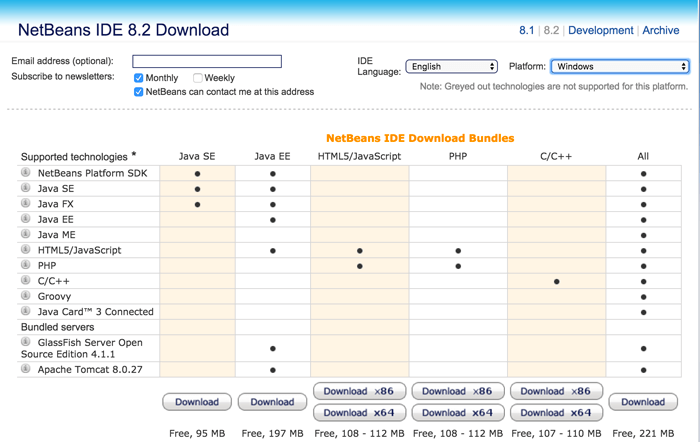 How to install Netbeans 8.2 Integrated Development Environment (IDE) for Java Application and Web Application Development. Previously we have learned how to install java development kit and its path. Now let get started with the integrated development environment (IDE). One of my favorite IDE since a few years ago is Netbeans, it's powered by Oracle that one of high concern in Java Technology. And this link is where we can download specially for Windows installer. As you can see, it has choices depends on your Windows architecture and Netbeans features. Just click your desired download and wait download completed. Then run installer just simply click next on question until installation finished. Now you can run Netbeans from start menu or desktop.